By 2020, Christians in Sport aims to see the gospel reaching sportspeople in 121 cities and towns across the UK. 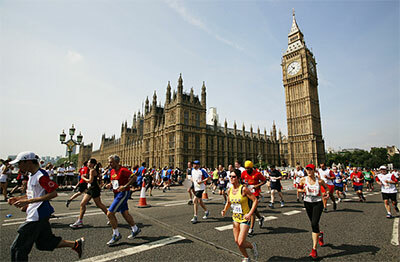 With a population of 8.8 million, London is one of the places the charity is particularly focusing on. The UK’s capital is certainly a sporty city, with 40 per cent of Londoners taking part in two or three sessions of physical activity a week. But fewer of these are playing sport in traditional clubs and teams. For example, running groups meet regularly in most of the city’s parks and others play football or rugby in work-based teams, while much of this happens away from ‘traditional’ weekend matches. All this means there are many great and varied opportunities to reach sportspeople with the good news of Jesus. The ministry is partnering with churches across the city to see how they can best do this in their different contexts. Here are just three examples of what this work looks like. Dundonald Church in Raynes Park, near Wimbledon, is part of the Co-Mission network of churches in the capital. Ministry Trainee Pete Greene, a golfer and cricketer, helped set up Dundonald’s Sports Network with rugby player and Christians in Sport Intern Jos Edwards after attending the London gathering. “We meet once a month to pray for our non-believing teammates, for opportunities and for boldness to share the gospel. If you’re the only Christian in your team, you can feel a bit isolated, but if you’re part of a network like this, then it really encourages you. It’s a fledgling group, but we’re encouraging each other that our sport is a mission field. During the Six Nations rugby tournament, the church hosted a barbecue and showed the England v Ireland match on a big screen. Around 100 people came and they kicked off with a gospel talk. A few miles north, a group has also started at The Boathouse Church in Putney, another Co-mission church, which has around 50 adult members. While lots of the group are part of clubs and teams, others play sport on a more ad-hoc basis, like so many of their fellow Londoners. Touch rugby player and paddle boarder Beth Cutting said hearing about the vision of Christians in Sport had spurred members into action. “After that, we did a survey to find out how many people in the church were playing sport. It showed 40% of our adults were engaged in regular physical activity. All of them were interested in meeting together to pray about their different sporting contexts. Since September, we’ve been meeting once a month for breakfast before our Sunday morning service to pray and share something from the Bible. The church used one of their monthly Boathouse Session outreach events to host a Sports Quiz, while group members are looking for more training to help with one-to-one evangelism. Over in south east London, staff member Linvoy Primus (right) has helped Christ Church Bromley set up a monthly Bible study for local professional footballers. Matt Lloyd, the church’s associate minister for evangelism, said: “We had one footballer in our church already and Linvoy linked us up with another two. Linvoy leads the Bible study and I help. They are all Christians at the moment and it’s in early stages, but we’re praying for gospel opportunities with teammates. Matt, who plays wheelchair tennis, said the church are also thinking about other ways they can reach out to their local sporting community.